This version mounted the first and second chassis models, both of them with the motor-driver boards at right and left sides and the button set on the top. The first Bluetooth interface was implemented in this version and it could be controlled sending text lines describing movement commands with an Android Bluetooth terminal app. It was launched on the Streets Science Day in May 2015. 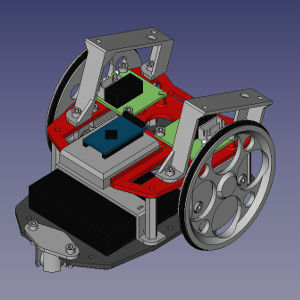 The new chassis design is more compact reducing the plastic and printing time down to 50%. 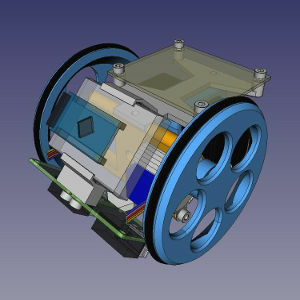 It incorporates the concept of modular hardware to join the parts with brackets to the electronics, batteries and other optional modules. Another interesting feature, due to its small size, is the possibility to make turns in square cells of 10cm x 10cm. The firmware is able to detect long key press and doubling the functions for keypad, introduces the pause command and the code is simplified to allow extend the Escornabot behaviour easily.